Driven by validated models of infant cardiovascular, pulmonary and neurological systems, BabySIM is an infant-sized simulator with advanced physiology for the practice of life-saving care. Weighing 16 pounds, the infant simulator has eyes that blink, variable pupil size, cooing, crying, tearing and secretions from the ears, eyes and mouth as well as bulging fontanel capability. BabySIM can produce heart, bowel and breath sounds, including bilateral chest excursion and seesaw breathing. With a realistic model of an infant airway and spontaneous ventilation, the BabySIM enables clinicians to practice response to airway trauma or obstruction, including esophageal, nasal and oral intubation, BVM ventilation and laryngoscopic procedures. 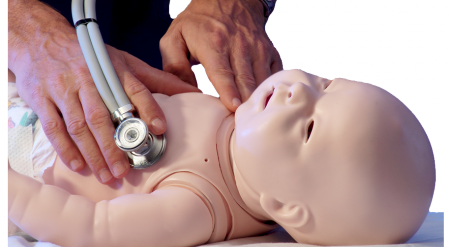 CAE Healthcare's BabySIM responds to chest compression, defibrillation and pacing, and allows safe practice of needle decompression, chest tube insertion and intraosseous insertion. BabySIM features four preprogrammed Simulated Clinical Experiences (SCEs) and integrates with CAE Healthcare’s learning modules developed specifically for infant nursing and emergencies . Each learning module contains evidence-based training scenarios designed to immerse learners in a clinical environment. The scenarios include learning objectives, facilitator’s notes, equipment and supply list and software application.